Project #3: Synthesis, characterization and fluorescent analysis of a new class of chromophore-terminated polycaprolactones and polylactides. With the increase in demand for polymeric imaging agents, expanding the scope and diversity of LPMs is an emerging area of research. While there are several different design strategies to formulate boron-containing polymers, end-functionalized polymers are most common in monitoring the health of living cells. The large macromolecular polymer backbone allows for diffusion across the cell membrane while the chromophore acts as a luminescent cell marker (Figure 1a). However, in designing new chromophore-terminated polymers one must consider 1) the optical (fluorescent) activity over time especially in an aqueous media, 2) cell membrane permeability 3) and compatibility within living cells. Therefore, the overarching goal of this work is to develop several new LPMs and evaluate their optical properties. 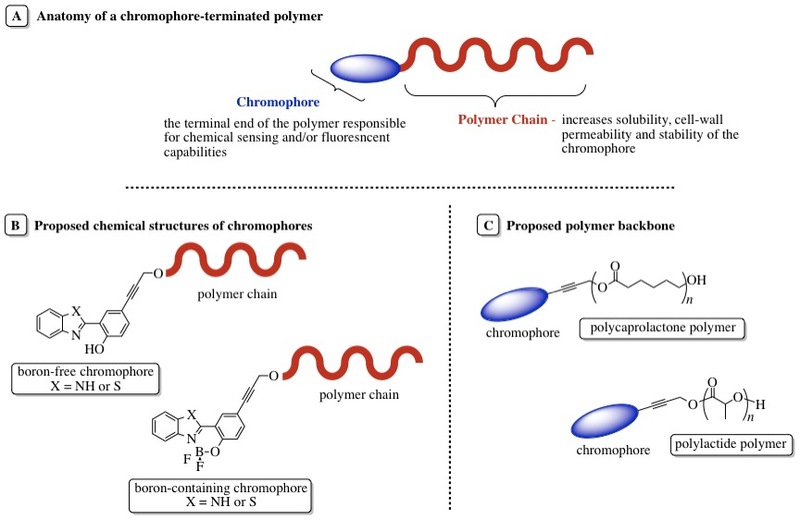 Figure 1. a) Anatomy of end-functionalized chromophore-containing polymers. b) Chemical structures of new chromophores. c) Polymer backbones used to prepare new end-functionalized polymers. Goal 1: Synthesis of new chromophores – Jenna applys synthetic organic chemistry techniques to design and synthesize several new boron-containing chromophores (Figure 1b). This work builds upon a foundation work by several undergraduates. To-date Jenna has prepared two chemical initiators. Goal 2: Attachment of the chromophores to biocompatible polymers – One of the design features of each chromophore prepared in Goal 1, is that is must contain a synthetic handle from which the polymerization can occur. Using this synthetic handle, the chromophore will initiate polymerization of lactide or e-caprolactone monomers to prepare four new systems (Figure 1c). Goal 3: Examine the photophysical (fluorescent) properties of these new polymers – Examination of the photophysical properties of these materials will deepen and extend scientific knowledge in LPMs.